Every August I set up my tickler files, update the family and Google calendars, and get ready for the onslaught of papers. From the archives, I’m sharing my current system for staying on top of the school stuff. I trained my children over the first week the habits I mention in the post. This gave me time to attend to other matters when we walked in the door together after school. Next Wednesday is the first day of school for my children who attend Catholic school. My teenager who attends public high school starts today. I know I’ll be deluged with piles of papers and forms to fill out for the first week, and then a regular communication envelope will come home on Tuesdays for my elementary school children. The first night handling the papers is the roughest. It gets easier if you have a system in place. If you don’t have a system yet, get something in place and tweak it later. Decide how to handle the papers when they come home, and what happens to them once you process them, whether it’s tossing, filing, or sending the paper back to school. This year, I’m training my children to use inboxes. Last year, I emptied their folders daily and the communication envelope weekly. After dinner, I would review the papers sitting on my desk and process them. This year, my children will learn to empty their backpacks of school papers immediately after they walk in the door. The inboxes are labeled and set up in our dining room which is close to my office. 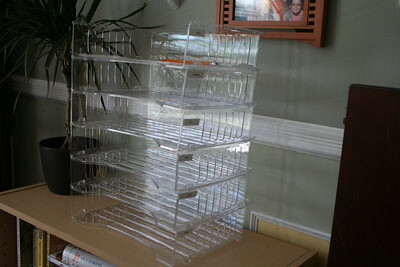 I found the clear trays as a set of 6 at Staples for $13.99. My original plan was to have vertical boxes hanging on the wall in the kitchen next to our family calendar, however, I couldn’t find what I was looking for. Ultimately, when my children are older and trained, they will find that if they don’t remember to file the papers, there will be consequences for them like missing out on a field trip. For several years, I’ve had a file crate set up in my office with hanging files for each week of the year. I keep school work, invitations, event flyers, birthday and anniversary cards, the monthly school calendar, and pretty much anything else time-sensitive which isn’t a bill. I put my file crate together based on the system outlined by Dawn at By Sun and Candlelight. This summer I switched over to using an electronic planner for my family stuff and blogging. I’m still tweaking the system. In addition to the electronic planner, I have a wall calendar in the kitchen, and a 5.5 x 8.5 paper calendar on my desk which I carry with me to appointments. Until I’m out of the toddler stage, I find I make fewer mistakes scheduling appointments when using the paper calendar. Take 10 minutes to process all the papers everyday. I like to do this shortly after my kids get home, but sometimes I’ll do it after dinner. Ones needing a check go into the bill file if they have a due date more than one week. Others are handled immediately and go back in the folder in the back pack. Requests for volunteers – Decide immediately if interested. Check the calendar for availability and make a decision. Send the paper back the next day in the folder. School projects and homework – Review the homework journal for upcoming project due dates. Discuss the project with your child and set up times on the calendar to work on the project. Once the times are scheduled, it’s easy to keep the project moving along. Make sure any supplies needed are on your errand list for the week. Donations – Decide if you need to buy anything and put those items on the errand list. Put the reminder in the tickler file for the week due. Sports schedules – put these on the calendar immediately and review for conflicts. Keep schedules in the planner or in a file with the tickler files. Reviewing the papers and handling them takes 10 to 15 minutes each day. Filing the time-sensitive ones and the ones needing a check require another 5 minutes. You’ll be grateful for the time spent the evening before. Wow, you have such a great system going! My son is the only one in school right now but as the others enter, I’m definitely going to need a more organized system. Saves a lot of time and stress to have a plan! Thanks for sharing at Thrifty Thursday, we’re featuring your post this week! Jenn @ The Purposeful Mom recently posted..Giveaway of an Organizing Utility Tote from Thirty-One!! I have to admit that I borrowed the idea from By Sun and Candlelight and tweaked it to meet my needs. When I was couponing, I tucked the inserts in behind each week’s file. With 4 kids in school, the files are bulging by the end of the school year. I also don’t worry about losing stuff.